S4GA is a European manufacturer and supplier of hybrid and portable lighting systems for airfields. Having implemented many projects all over the World, we are recognized as reliable solutions provider and trusted partner in aviation industry. 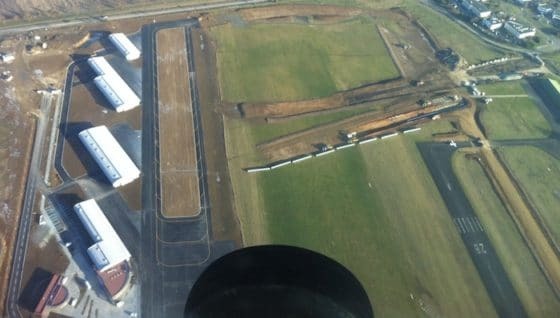 S4GA has recently signed contract for delivery of first hybrid airfield ground lighting for the first Aerodrome in France – Aérodrome de Chartres – Champhol. Contract will be executed by S4GA French partner – ALPHA-AIRPORT. Chartres – Champhol Aerodrome is a general aviation airport located in north-central France and serving Chartres and Champhol. The airport has a rich history starting from the end of the nineteenth century. It was dedicated to cavalry, acted as training center for pilots during the wars and was used by French Air forces after the War. Nowadays the airport became civil. It serves as air base for aeroclubs and training organizations. An industrial park was built on part of the former airport. Alpha Airport specializes in airport terminal equipment and airfield lighting solutions. This is a leading integrator in French airport industry. ALPHA-AIRPORT provides a full range of services starting from project management and design to its implementation: technical studies, supplies, training, installation and supervision and after-sale support. In 2017 the companies have started their cooperation. ALPHA-AIRPORT will soon perform installation of S4GA hybrid AGL system for Aérodrome de Chartres – Champhol. ALPHA-AIRPORT will be also responsible for after-sales support.